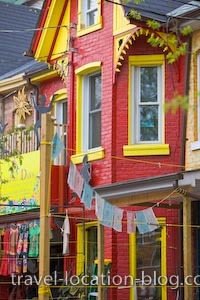 Picture of a funky shop housed in an old Victorian Style house in the Kensington Markets, city of Toronto, Ontario. at the Kensington Markets, Toronto. Funky shops and unique stores add to the unique character of the Kensington Market district in downtown Toronto. Old Victorian style houses are coated in bright paint while merchandise is hung outdoors to attract the attention of passers-by. Funky shops in Victorian style houses at the Kensington Market, Toronto, Ontario, Canada.